For just a second when you saw the picture you asked yourself, “What are they doing to the shroud?” Right? Maybe it was just me. Maybe it is because I haven’t had coffee yet. To a dispassionate or incurious eye, they are merely two planks of gray weathered wood, something you might come across moldering in the brush behind a log pile at someone’s Santa Cruz Mountains cabin. 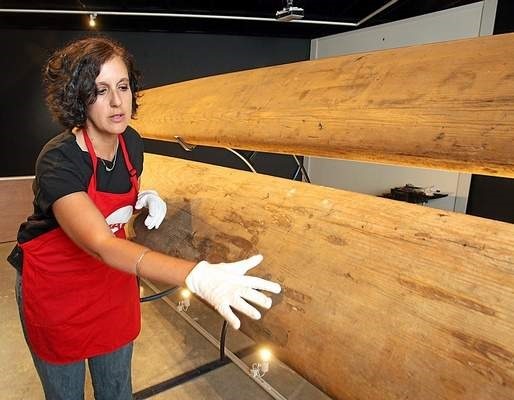 But through the eyes of Kim Stoner or Geoffrey Dunn or Bob Pearson or Barney Langner or any number of surfers and/or spectators at a special ceremony at the Museum of Art & History last Thursday, these two planks of wood carry a staggering cultural meaning. In the world of surfing, they are the Rosetta Stone, the Shroud of Turin, the Hammer of Thor. They are the paintings on the cave walls at Lascaux, Shakespeare’s first folio, Babe Ruth’s first bat. They are the First Surfboards. Perhaps it’s just me, but I do not recall any other period time with the exception of 1978 (maybe) when the Shroud was infiltrating the public consciousness to such a degree.. These random references to the Shroud seem to be multiplying. A Nice Story Is Colin Berry Onto Something?